Double Indemnity's squeaky clean working man who winds up sullied by an alluring temptress is creatively tied in with Rear Window's voyeuristic framework in 1954's incendiary film noir Pushover. 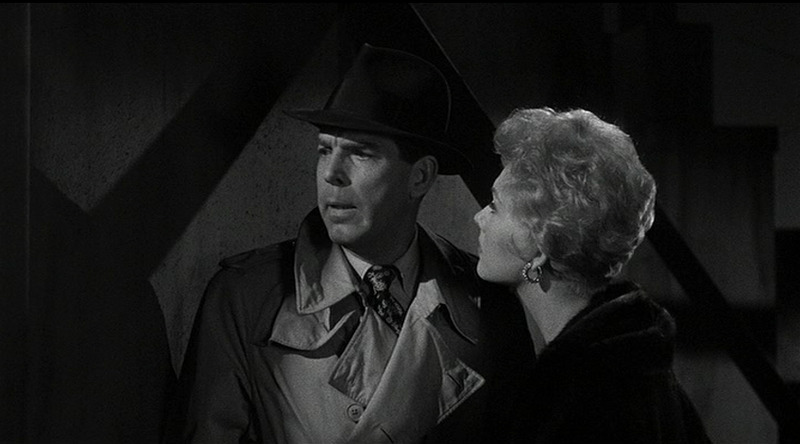 Instead of Double Indemnity's insurance agent, this time Fred MacMurray's "pushover" is cop Paul Sheridan, assigned to stake-out a bank robber's moll, Lona McLane, played by the devastatingly gorgeous Kim Novak in her first credited role. Both are perfectly cast: MacMurray has that devious, authoritatively smooth, fast talking persona down pat. He's cool under fire unless it's the hot melting blaze of Novak, who replaces Barbara Stanwyck's hard, scheming edginess in Double Indemnity with a soft, curvaceous vulnerability. As Sheridan and McLane become increasingly embroiled with one another and their criminal plans, so do we. This is mostly due to the expert helmsmanship of the under-appreciated director Richard Quine, whose forte was probing his characters' disoriented, desperate and often lovesick souls in films such as this, Drive a Crooked Road (1954) and Strangers When We Meet (1960). Perhaps the director had a personal affinity for these types: Quine's marital engagement to his often employed leading lady Novak ended abruptly and in 1989, at age 68, he committed suicide. Aside from a successful foray into romantic comedy with films like The Solid Gold Cadillac (1956), Bell Book and Candle (1958), The Notorious Landlady (1962) and Paris When It Sizzles (1964), Quine directed the outstanding dramas Hotel (1967) and The Moonshine War (1970). Pushover's engaging screenplay was written by Roy Huggins, best known for creating the TV series The Fugitive (1963 - 1967) and was adapted from the novel "The Night Watch" by Thomas Walsh also the author of another excellent film noir Union Station (1950). Pushover boasts a strong supporting cast including Philip Carey, Dorothy Malone and E.G. Marshall but its real strength lies in effectively communicating the hopes and dreams of our central couple mightily motivated against a formidably steep uphill climb. Even so, there are film noir's reoccurring signs of knowing that the desperation behind that motivation must ultimately seal their tragic fates. Viewers can better appreciate Quine's specialised directorial skill at exploring the film noir universe when Pushover airs Sunday, December 3 at 7am PST, the next film in Eddie Muller's Noir Alley. Immediately following Pushover, that perennial holiday favourite The Shop Around the Corner, previously recommended here, will open for business and our viewing pleasure. This delightful film will air three times this month: Sunday, December 3 at 9am... Friday, December 15 at 5 pm... and Monday, December 25 at 3pm. All of the listed showtimes are Pacific Standard Time. 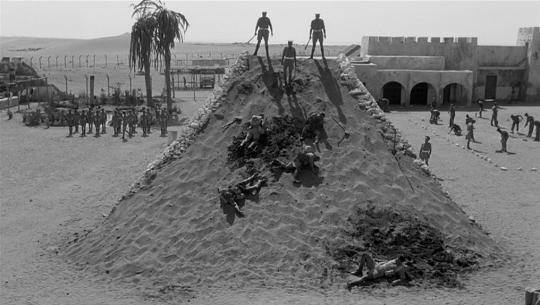 The Hill, Hidden Gem # 59, is one of cinema's most intense dramatic achievements. This hard-hitting British gem has been "inspected" (reviewed) here. It is scheduled to air on TCM Monday, December 4 at 1pm PST. My next recommendation is a film a few of you may have heard about: 1944's Academy Award Best Picture Winner Casablanca. This choice may come as a surprise to readers more familiar with my past articles since it is included on a list of overrated films and reviewed for those same individuals here. There is no denying the fact that this film casts a magical spell and is certainly capable of sweeping one up in its appealing blend of romance, sacrifice and political intrigue. Besides, for those who haven't seen it, or seen it enough, how are they to know if my criticisms are sound? This 1942 classic, one of Hollywood's proudest, airs Friday, December 8 at 8:45am PST and again on Saturday, December 16 at 1pm PST. Film noir has few representatives as dourly defeatist or as forcefully communicative on the subject of human relations than 1945's Scarlet Street, previously reviewed here. Edward G. Robinson as Christopher Cross will take his fateful walk down that dark and foreboding street Monday, December 11 at (early morning) 4:45am PST. Another Edward G. Robinson film to see is Dark Hazard: Hidden Gem #52. This has also been previously reviewed as a TCM recommendation here. He’ll race from the gate Tuesday, December 12 at 10:45am PST. Although many have compared the re-make unfavourably to a previous version released a decade earlier, 1941's Dr. Jekyll and Mr. Hyde has many attributes as well including a noir-like focus on the title physician's more beastly and repressed thoughts and desires. This previous TCM recommendation has been reviewed here. The Dr. will begin his transformation Tuesday, December 12 at 11:30pm PST. Ace in the Hole is Billy Wilder's scathing examination of American opportunism and moral depravity via cocky newspaper reporter Chuck Tatum, played with unrelenting cynical ferociousness by Kirk Douglas, a film previously reviewed here. Both director and actor will play their hand Wednesday, December 13 at 6:45pm PST. Next is Barbara Loden's incredible directorial debut Wanda, Hidden Gem #29, a previous TCM recommendation here. Her appearance will occur on Wednesday, December 13 at 9pm PST. My next TCM recommendation comes with a caveat: If you haven't seen the film before, please do so before reading my review. Doctor Zhivago is the latest in a series of Top Ten Fool's Gold: The Overrated and will be shown on TCM Thursday, December 14 at 7am PST. 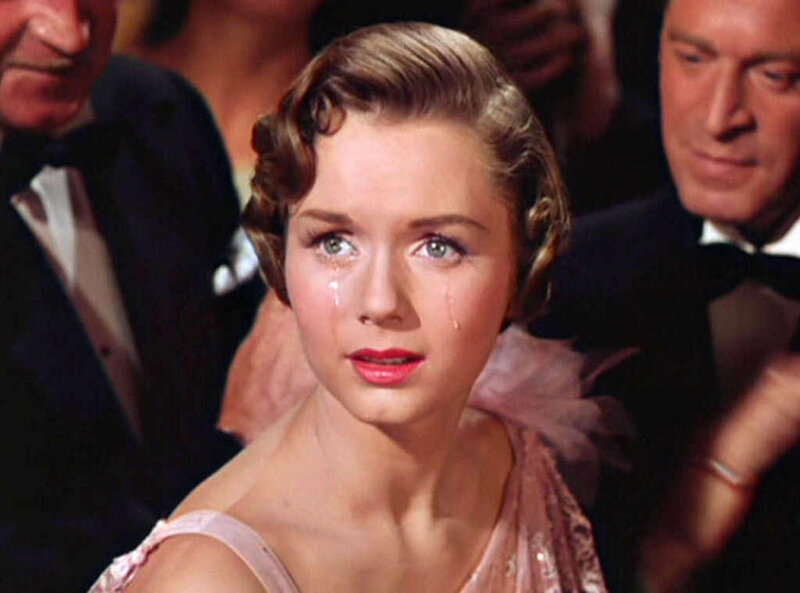 MGM's 1952 musical Singin' in the Rain was not adapted from a stage production, though the film was later turned into one, being first presented on stage in 1983. Its abundant creativity, innovation and driving energy place this film at the top of all cinematic musicals ever produced. Singin' in the Rain has been reviewed as a past Blu-ray selection here and will joyously dance its way onto TCM Saturday, December 16 at 5pm PST. In writing about Casablanca, I mentioned that uncredited writer Casey Robinson was hired to boost the romantic flashback scenes between Rick and Ilsa (Humphrey Bogart and Ingrid Bergman) that took place in Paris. The couple’s shared emotions would give weight to Rick’s despondency after going unfulfilled, and again when making his final sacrifice at the airport. It is my contention that because we did not see the relationship develop before or during their stay in Paris, and having little advanced knowledge of either one individually, these scenes, ineffectively anchored and introduced to the narrative, substantively lessened the film’s overall dramatic expressiveness. Casablanca’s producer Hal Wallis had just completed another film, 1942's Now, Voyager, with two of Casablanca's stars, Paul Henreid and Claude Rains. Now, Voyager also had a strong intimate relationship as its focus. This time, however, in adapting Olive Higgins Prouty's novel, Casey Robinson was able to achieve a far grander display of romantic fireworks. We get to know Bette Davis’ Charlotte Vale quite well, watching her convincingly transform from a dowdy spinster severely lacking in self-esteem, to stylish independence, slowly but surely gaining confidence, before meeting Paul Henreid’s married architect Jerry Durrance. They meet on a cruise to South America, one that Charlotte was strongly encouraged to take by her psychiatrist Dr. Jaquith (Claude Rains) after spending time at his sanatorium. Charlotte and Jerry fall in love but it is a gradual development we witness from the start, maturely and endearingly presented. While the makeover, linked to a newly-found romantic discovery, is a construct admittedly “soap operatic”, Charlotte’s more than credible and engaging backstory, including an inferiority complex derived from her dominating mother (Gladys Cooper) and her twice needed recoveries at Dr. Jaquith’s rather unorthodox clinic, successfully diffuse the formula’s familiarity. Speaking of the good Doctor’s sanatorium, the facility and its doctrines were based on Massachusetts’ Austen Riggs Center where the novel’s author once sought treatment. As the film portrays, the institute shunned commonly applied practices of the time including electroshock, insulin coma and lobotomies, in favour of physical activity, occupational and verbal therapy. The dramatically crucial scenes taking place at the hospital, along with the immaculate performances by the cast under director Irving Rapper’s sure direction, not only enhance the story’s realism, they help to authenticate Now, Voyager’s many heartfelt moments of striking contrast, genuine passion and resonant sincerity. 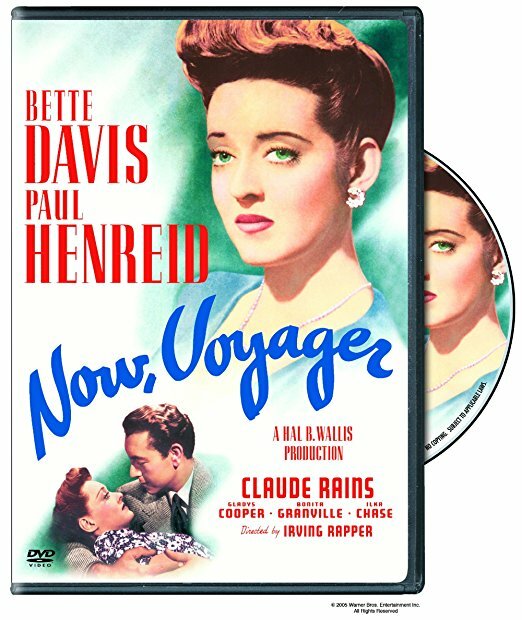 Now, Voyager will set sail (updated) Friday, February 8 at 5pm PST. "And then I saw her - coming out of the sun. And I knew why Whit didn't care about that 40 grand." 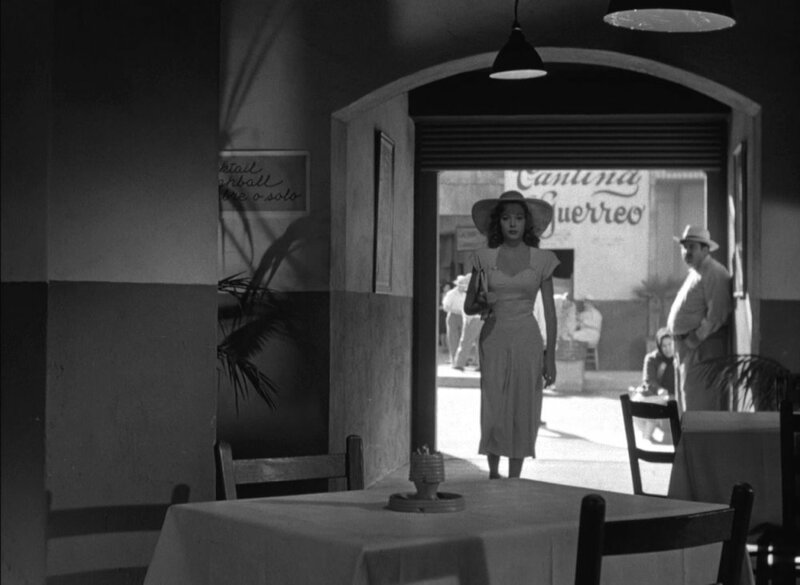 Out of the Past, is one of film noir's finest and most highly recommended here. She will arrive Monday, December 18 at 11am PST. The next film to see is Guys and Dolls, a rollicking "good time" musical. It's a previous TCM recommendation here. Those distinctively funny and delightful characters will present themselves Friday, December 22 at 2:15pm. Along with The Shop Around the Corner this month, TCM is presenting another top Christmas Holiday classic, Remember the Night, previously recommended here. The stars of this delightful cinematic charmer re-teamed for the later-made Double Indemnity. The night to be remembered is Friday, December 22... at 7pm PST. Alfred Hitchcock's Vertigo is loaded with multi-faceted insights and hidden rumination on human relationships, providing viewers with much to ponder long after this tale of romantic obsession ends. This cinematic treasure was previously opened here, and will avail its visual and aural riches Monday, December 25 at (late evening) 1:45am PST. This month's Happy Birthday shout-out goes to one of the most recognised stars of cinematic horror, British born Barbara Steele who turns 80 on December 29th. She's proven equally adept at exuding on screen innocence or maliciousness and has been dubbed "The Queen of All Scream Queens." Her breakout, not to mention most haunting, role was starring in Mario Bava's Black Sunday (1960). Other horror films benefitting from Barbara's highly expressive performance include The Pit and the Pendulum (1961), The Horrible Dr. Hitchcock (1962), The Ghost (1963), Castle of Blood (1964), An Angel for Satan (1966), The Crimson Cult (1968), Piranha (1978) and The Silent Scream (1979). She also had a small but memorable role in Federico Fellini's 8½ (1963). Later in her career she found success as a producer, first as an associate producer on the TV miniseries The Winds of War (1983) and as producer on War and Remembrance (1988) for which she received an Emmy award. Barbara made an appearance on the revival series of Dark Shadows in 1991 and as herself in Clive Barker's A-Z of Horror (1997). More recently, she starred in Italian writer/director Jonathan Zarantonello's first English language film, The Butterfly Room (2012). December's Soundtrack recommendation is Close Encounters of the Third Kind composed by John Williams. The film itself may be an appreciable letdown when reaching its ambiguous conclusion, especially regarding the aliens' purpose in abducting and then benignly returning humans to earth. During a film's production, the final "point of contact" for dramatic infusion lies with the composer. Here, it is left to John Williams, who communicates practically all of the narrative's primary conflict with his sophisticated and vigorous musical contribution. At the film's conclusion it is he who expresses in a most splendid fashion the story's fundamental emotional resolution as well. His score has it all: other-worldly ambiance, mystery, wonderment, tension, and glorious fulfilment. This 2-CD limited edition (5000 only), made possible by the combined efforts of La-La Land Records, Sony Music and Columbia Pictures, has presented John Williams' score as a grand symphony on disc one. On disc two, there are many of the 1977 album tracks including alternate cues and previously unreleased source music. For more information on this definitive release, including ordering from Intrada Records who ship internationally, click on the accompanying image. This month's DVD selection is the prior TCM recommendation Now, Voyager. This emotionally stirring romantic drama can be ordered from Amazon.com in the U.S. by clicking on the image.